Today, we’re looking at another retro throwback from Thunderkick games. Under our reviewers’ careful examination is Arcader. 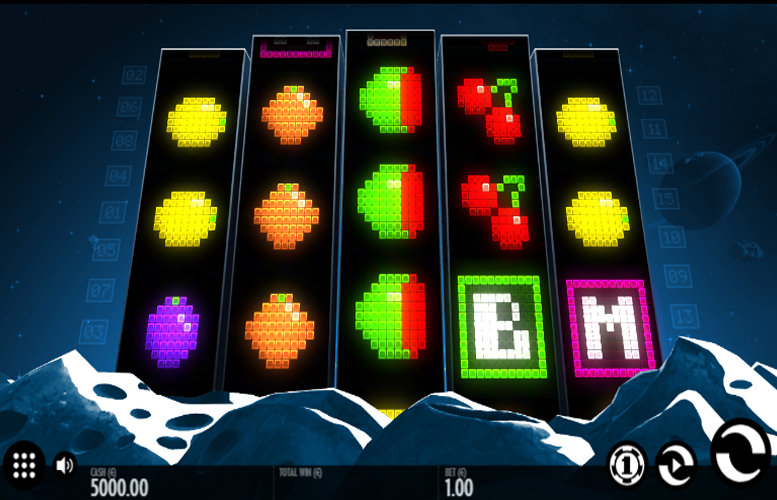 The title itself resembles an old-school arcade machine and uses the symbols from a classic slot machine. It’s a nice theme that is well-supported by the animations between wins and the soundtrack. In terms of specifics, Arcader is played across a standard five reel, three row gameboard. It features both a free spin and “pick-a-box” style bonus, as well as a cool expanding reel feature. We’ll explain all of that later though! Generous free spin mode. The chance to play for free with a 9x multiplier is a great reason to play the Arcader slot machine. Several great bonus features. Thunderkick games sometimes rely too heavily on just one side game. Arcader has two full additional game modes, plus an added dynamic during the base game. Great theme. We love these retro throwback titles by Thunderkick. Arcader happens to be one of their strongest too. Kind of low main game prizes. We’ve seen some titles award as much as 10,000x a single line bet. This makes Arcader’s 20x seem miniscule in comparison. Bar = 20x the total bet. Lucky Seven = 9x the total bet. Liberty Bell = 3.6x the total bet. Watermelon = 3x the total bet. Lemon = 2.4x the total bet. Grape = 1.8x the total bet. Orange = 1.5x the total bet. Cherry = 1x the total bet. 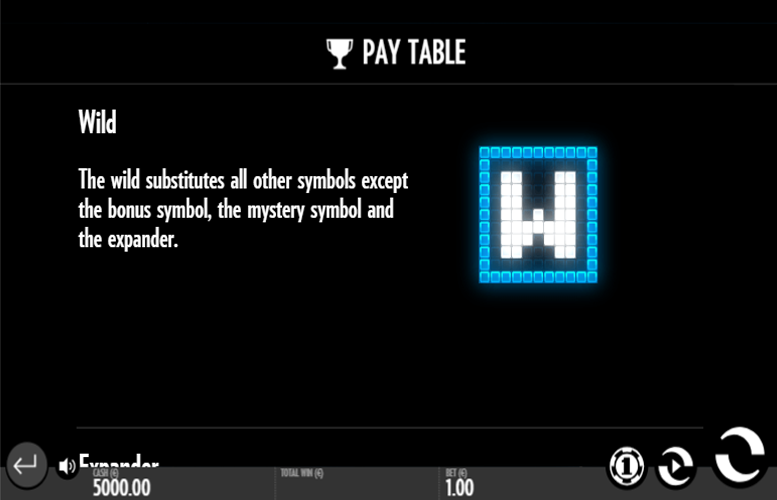 Much bigger wins are available via the mystery game feature than purely from the games symbols. The “Expander” symbol will expand the reel it lands on with the symbol representing whatever creates the best possible pay line win. 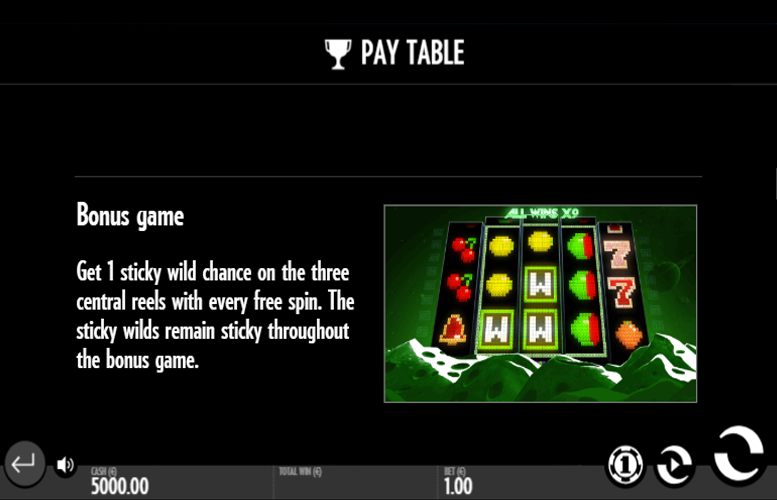 Like with many Thunderkick titles, one of theArcaderbonus features is a free spins mode with an added multiplier. 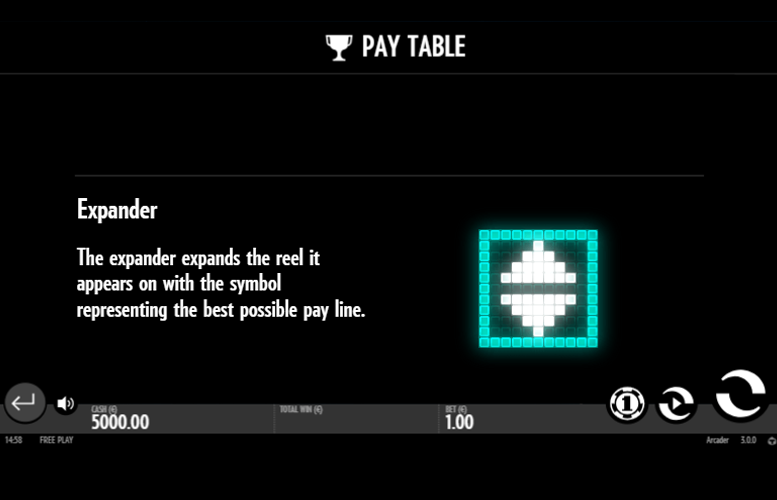 To trigger it, players must land three or more “Bonus” symbols anywhere on the reels. The title’s bonus symbol is a green, pixelated “B”. 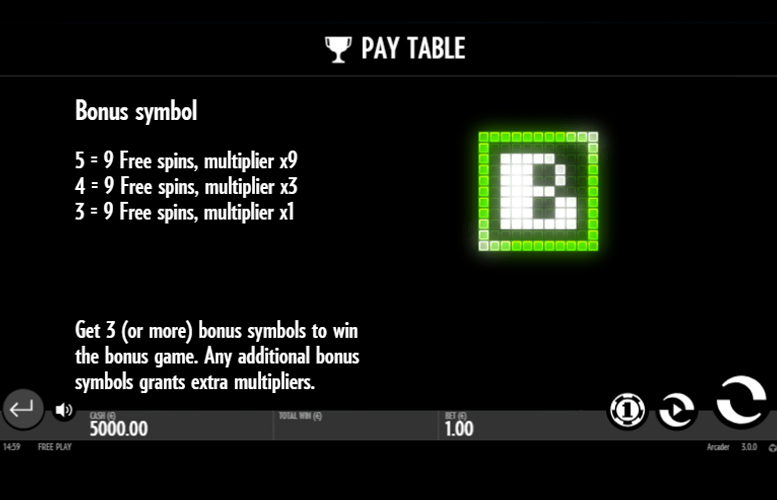 Three “B” symbols = nine free spins with a 1x multiplier. Four “B” symbols = nine free spins with a 3x multiplier. 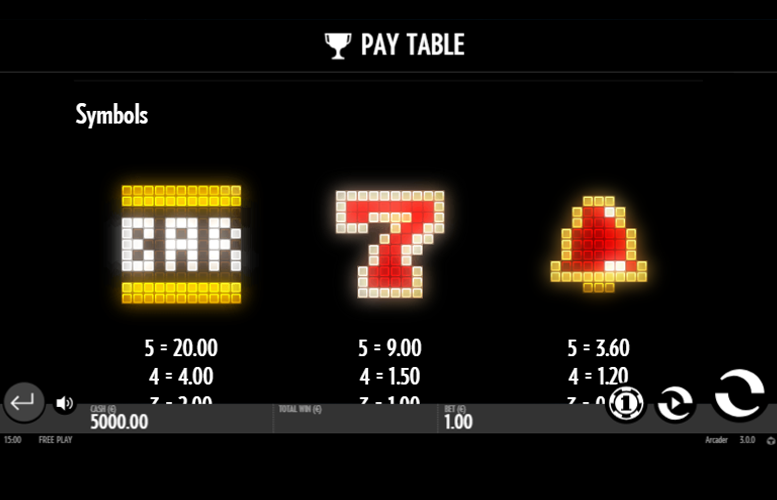 Five “B” Symbols = nine free spins with a 9x multiplier. Players should note: Landing additional “B” symbols will award increased multipliers. What’s more, on every free spin, there is a chance that a sticky “wild” symbol will appear. These will stay frozen in position until the end of the free spin mode. Three “M” symbols = multiplier of 1x. Four “M” symbols = multiplier of 2x. Five “M” symbols = multiplier of 6x. Purple gem = 18x total bet. Green square = 12x total bet. Blue teardrop = 6x the total bet. Orange circle = 2x the total bet. Rather than presenting players with a range of different ways to distribute their bets across the reels on the Arcader slot machine, Thunderkick have instead favoured a simple “total bet” system. The amounts to bet on each spin range from just 10p to £100. We think that all but the very highest rollers around will find these limits more than adequate. We really love these retro video gamethrowbacks from Thunderkick and Arcader is certainly one of the best. It marries the themes of classic arcade and casino gaming delightfully in a game that not only looks great but also has enduring and exciting gameplay features. We particularly enjoyed the generous free spin mode. Players can unlock a massive 9x multiplier on it! With such a lucrative bonus, even the kind of measly main game prizes of Arcader don’t seem too bad! This game has a rating of 4 / 5 with 826 total reviews by the users.